Students tend to get distracted by their cell phones or computers when doing assignments. This article was written the night before it was due. Want to know why? Procrastination. Procrastination is written at the core of every living teenager: it’s ridiculously common. But don’t panic; the P word is completely normal. Studies show that 85-95% of students have a procrastination issue of one type or another. Humans are complex beings, so it stands to reason that they will procrastinate for all sorts of reasons. Here are some of the most common reasons students cite: they feel overwhelmed with too much homework, life is filled with too many distractions, they work better under pressure, they think other responsibilities are higher on their priority list, there isn’t enough time in a day, or they simply possess little self control. Homework is not the only procrastination category out there. 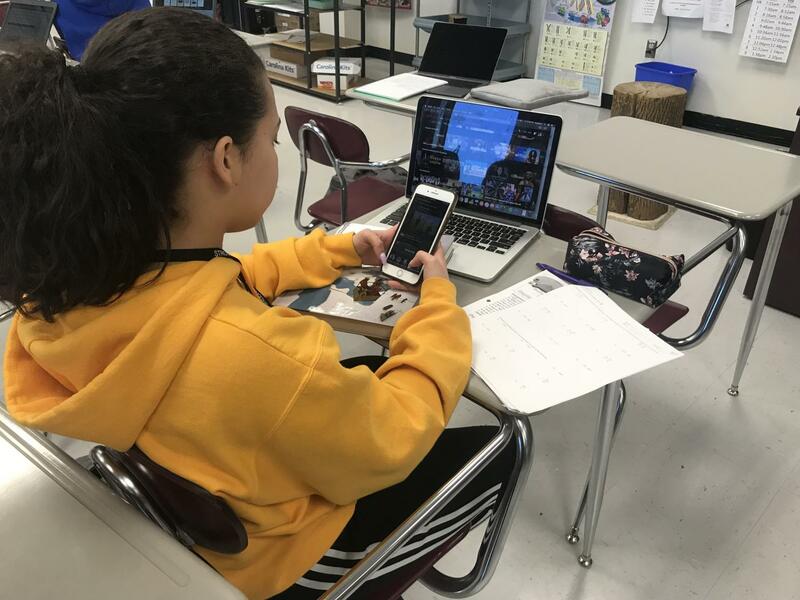 Students also procrastinate in regard to work, chores, self health, personal goals, sibling responsibilities, schoolwork, relationships, and more. In a survey, 57% said they procrastinate because it gives them a rush, and 43% said it is second nature to them. Neuropsychological and behavioral research, however, theorizes it has to do with the prefrontal cortex of the human brain. There are many theories, and many possible explanations. 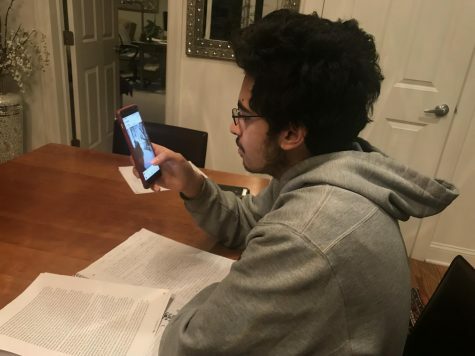 Procrastinating on homework through the use of technological devices is a common practice among students. Despite all of these categories, homework always finds its way to the top of the list. 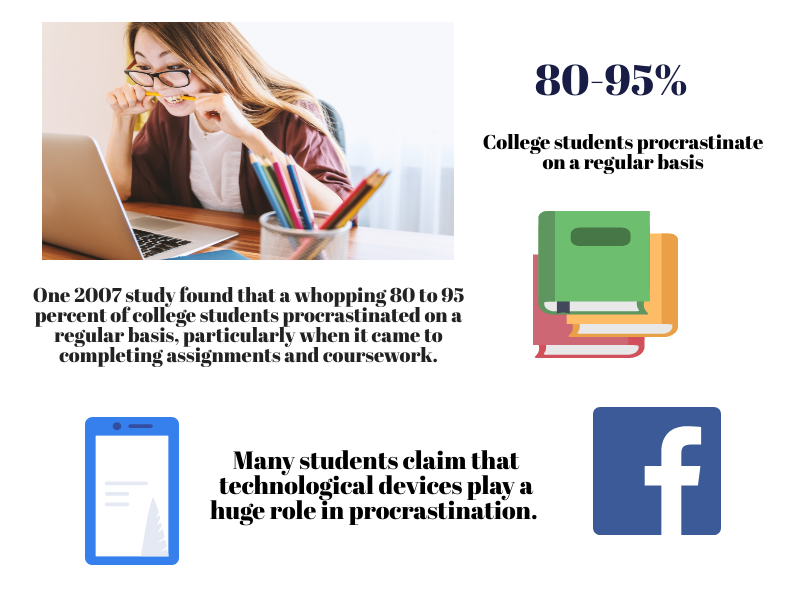 Found in a study by Piers Steel, a University of Calgary professor, 26% of the 2007 general population were chronic procrastinators, while approximately 75% of students, with homework, were chronic procrastinators. Procrastination affects over 20% of the population. According to some researchers, procrastination has more than quadrupled over the last 30 years. Procrastination statistics suggest that 40% of people have experienced financial loss as a result of procrastination. Another very common explanation is the recent increase of technology. Students have more devices, and those devices have more accessible shows, video games, and social media. When students feel pressure, they turn to procrastination. When students create a fear of failing, they turn to procrastination. Not always, but commonly. Talking about this issue with others can scare a teen even more, but sometimes that’s a necessary step to push through this self vs. self battle. This leads to the next step: overcoming procrastination. Writing down future assignments in a journal is one proven method to prevent procrastination. When it comes to procrastination, there are many useful coping tips. For a first example, students should consider keeping a personal planner/agenda for daily use. Writing things down where a daily system is in place helps all ages to remember the little things as well as big. Having a schedule within the personal planner/agenda also helps. 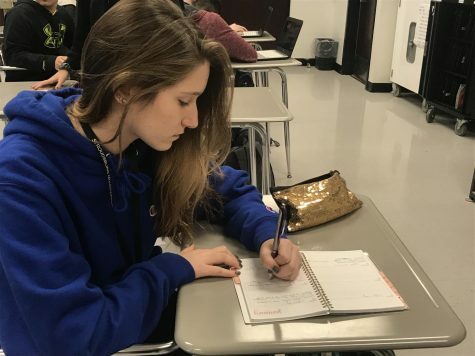 “I write things down and I actually do them when I say I’ll do them,” said English teacher Ms. Jennifer Batt. A second tip is knowing when to complete difficult tasks and when to skip them. It’s easy to get stuck on one goal instead of moving on to do another that’s more time appropriate. A popular theory is to do the hardest tasks first, but sometimes the difficult tasks are a roadblock that causes more and more procrastination. The trick is knowing what’s right for the individual. A third tip: post a large ‘to-do list’ for writing short and long term goals on a wall. Whiteboards and chalkboards are great for this tip, allowing the list to be easily changed. Please comment your own issues/feelings/solutions with procrastination below! Students need to know they’re not alone in their own mental wars.